Hologram Projector displays Floating 3D images with no special glasses required. 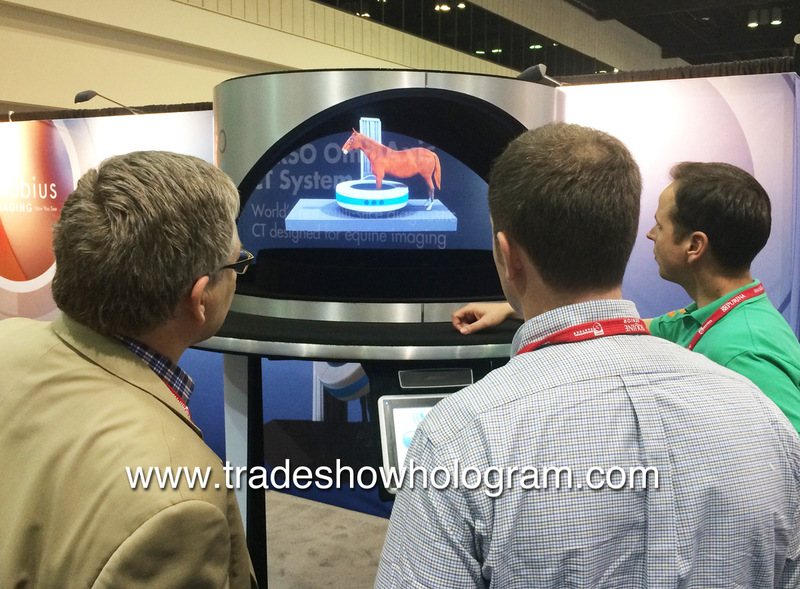 Trade Show Holograms is a company specializing in 3D Holographic Projection systems. Their holographic projectors create a stunning 3D effect without the need for the viewer to wear any 3D glasses. Its a clever optical illusion that fools the brain into seeing the 3D effect says Timothy Drake the CEO of the company. Drake has made perfecting the illusion a priority for the past 10 years and the results are visual magic. The company rents or sells the display to companies participating in trade shows where they want to stand out from the surrounding trade show booths. Their product presentation can easily be created in an interactive 3D presentation more likely to attract attention to their booth than a regular 2D presentation on a monitor. 2016 designs have all featured the companies new Ultra Bright system which greatly increases both the holograms brightness and sharpness. The new holograms can be seen from a much larger distance across a trade show floor. Large Hologram Projector – 3D Holograms float in mid air at trade show. In the crowded trade show environment every exhibitor is competing for the attention of trade show and convention attendees. These days an informative booth is not enough to get a message or sales presentation across to potential clients. Those customers have to have a reason to find a trade show booth interesting enough to give it a closer look. Trade Show Holograms are a popular way to attract attention to any booth or exhibit at at a trade show. The 3D hologram projectors are available for purchase or as a rental. 3D holographic images are seen by trade show visitors without the use of any special glasses. The displays are available in both the USA and Canada for trade shows, press conferences and media events. Large 3D Hologram Projector Exhibited at trade show.